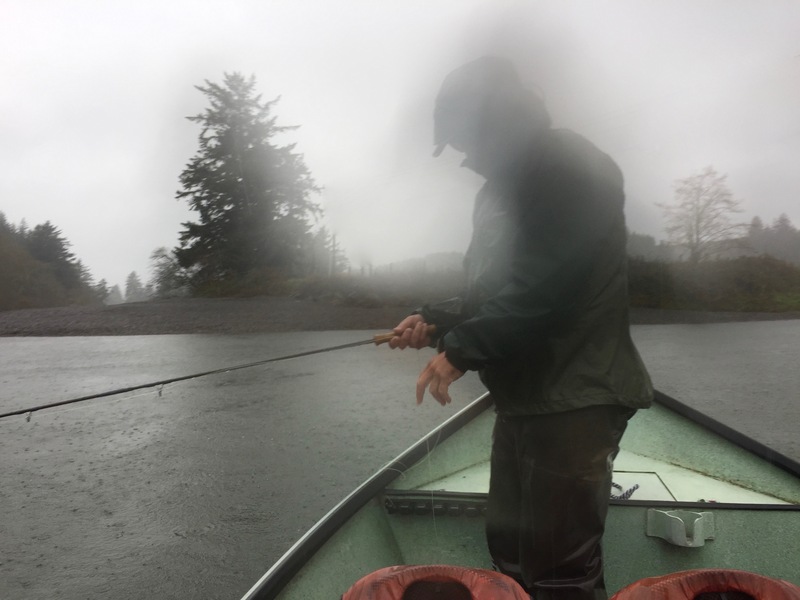 Late-fall fly fishing for ocean-fresh chinook salmon can be a compelling siren song. With the variables of weather, river level and clarity, tides, ocean conditions, other anglers, and luck all in play, as often as not, an angler’s dreams of Chrome encounters can be fraught with frustration. It’s easy to talk yourself out of going. 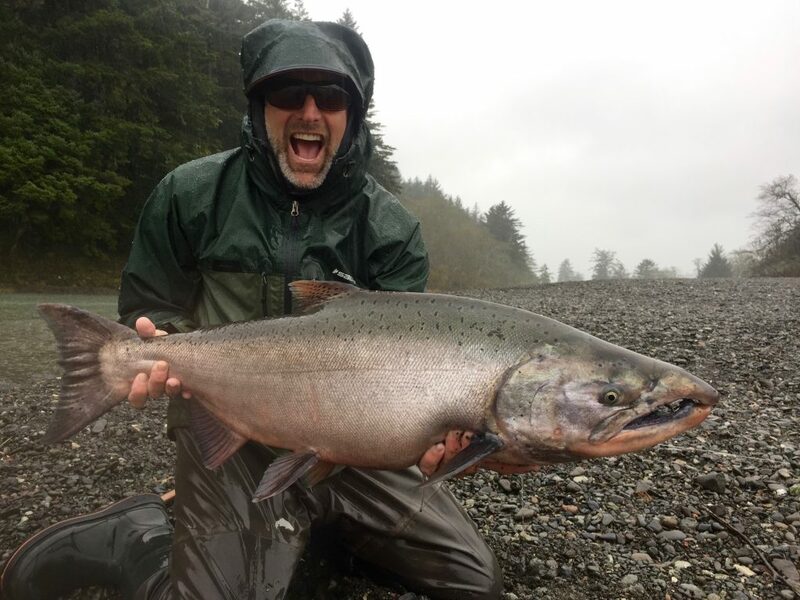 But the chance to connect with the ultimate prize on Oregon’s fly fishing Mt. Rushmore entices anglers to roll the dice even when it looks dicey. A recent 3-day outing illustrates: Day one came on the heels of some discouraging reports and featured constant torrential rain and wind, leading to a rapidly rising river. But the Two Dudes have good rain gear! So we launched, enjoying the kind of river solitude that only a true Oregon downpour can provide. As the river steadily filled with mud, leaves, and debris, we cast hopefully for hours. Would the salmon also be coming with the flood? In short: Yes! Three hours in, salmon began to roll and crash the surface. And they were in a biting mood. On days two and three, we were joined by our old friend, the Oceanographer. The weather improved, but thanks to Day one, the rivers were kinda high for fly fishing. Conditions slowly improved, but we saw only a few crackers here and there. Even the bait guys were shaking their heads. In the end, you can’t catch ’em if they aren’t there. 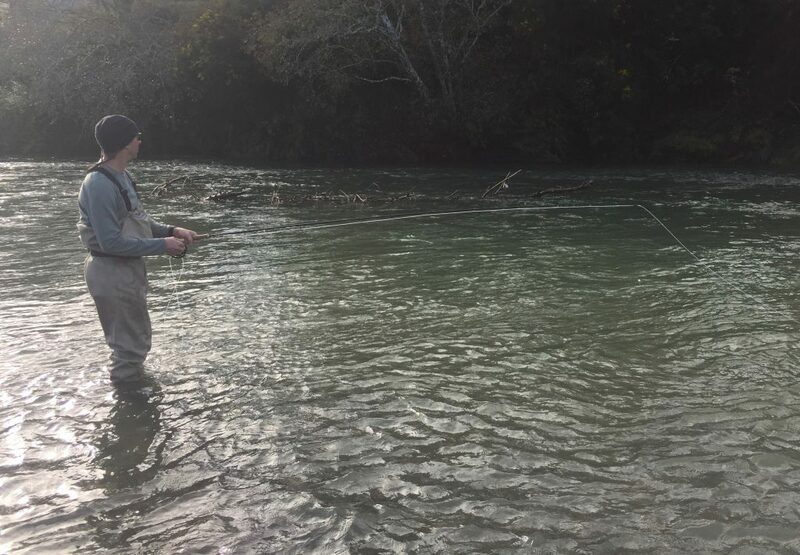 And while a few fish probably trickled past in the high flow, we spent our time casting and stripping, casting and stripping, casting and stripping until it was time to reel up and head home. A taste of success, followed by a full double-serving of skunk stew! Can’t wait to try again!